More than half of those surveyed in a new Gallup poll said that the television is their main source for news, and about 21 percent chose the Internet. 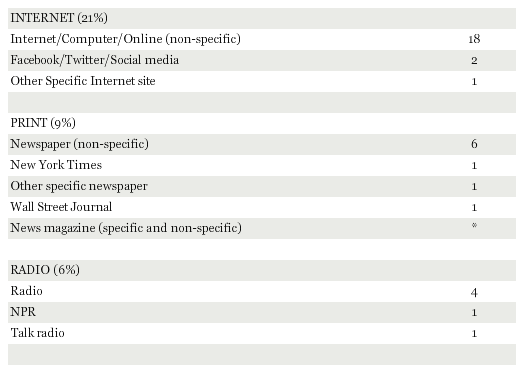 Less than 10 percent said print newspapers are their main source. One of the case studies in the report focuses on Denver (after quotes). Motivated by cutbacks at newspapers and thinner wire-service offerings, many public broadcasters are seizing new opportunities to fulfill their public-service mission and attract new members in the process. With the acquisition of new digital skills, they have a suite of assets – on air, online, mobile and social media – and newfound confidence to leverage those for greater community impact. Of note, while legacy news organizations increasingly erect paywalls in front of their journalism, these local public broadcasters are tearing down walls to reach out to partners – both nonprofit and commercial – to co-produce or share original content and to give longer tails to the best journalism in their areas. About a year after journalist Laura Frank started the nonprofit investigative news start-up I-News in her kitchen, she moved into offices at Rocky Mountain PBS in downtown Denver. From that humble beginning in 2009, she built, bit by bit, a half-million dollar news operation whose five-person team broke the kinds of news stories that changed laws and policy across the state. 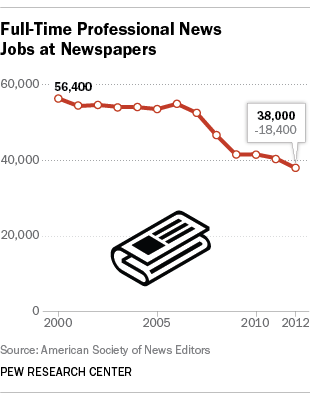 In all, there were about 2,600 fewer full-time professional editorial jobs at newspapers in 2012, a 6.4% decline from 2011. That leaves the industry at 38,000 full-time professional editorial employees and is the first time that figure has been below 40,000 since the census began in 1978.